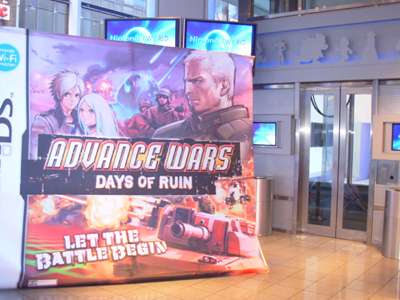 I picked up Advance Wars: Days of Ruin yesterday at the Nintendo World Store launch party (I arrived to the party late, but it didn’t look like I missed much…the only thing I saw there was Advance Wars: Days of Ruin banner hanging up, and everyone working was wearing Advance Wars shirts). After playing through a good number of the missions already I wanted to give some initial impressions of the game. The game itself is set in a world where meteors have recently crashed, kicking up huge amounts of dust that blot out the sun and pretty much everyone is dead. The few people that are still alive are killing each other (in turn based combat) for various reasons. Days of Ruin is a lot darker then Dual Strike, and the overall the game feels a little more mature then it’s predecessor. The units, however, still have a sort of “cute” look to them that sort of makes you feel bad when you have to sacrifice one for the betterment of the whole. Days of Ruin introduces some new units into the mix, such as a motorcycle unit that can capture bases, and a flare unit that can shoot a flare to an area and remove the fog of war around it. Also, units can now level up. Each time a unit kills another unit, it gains a level up to a maximum level of three. Higher level units have increased attacks and defense. You can also put a commander unit in another unit, which levels up the unit automatically to level three. Units around the commander unit receive bonuses. Commander special attacks are still there, just not as powerful as in Dual Strike. Other then that, the game plays very similar to Dual Strike. It’s just another Advance Wars game, and that’s never a bad thing. I’ve only played up the campaign up to level 12, and done a few of the bonus missions, but overall, at least so far, the A.I. hasn’t destroyed me…yet. I’m sure things get much worse, but so far I’ve been able to get an S rank on all the campaign missions. Overall I’m really enjoying the game and can’t wait to beat Robert over Wi-Fi. For some reason I thought it came out the 29th rest assured I will be picking it up tomorrow. I’ve got skills man, mad tactical turn-based skills.